A knife is only good if it's always on you, ready to be drawn. It isn't as effective when it falls out without you knowing about it. It's also not so hot when it gets tangled in the sash that you wedged it into. Oh, and getting it stuck in your belt probably isn't the optimal way to utilize a throwing knife. No, sir, you need a secure, stylish, easy-to-use hanger like this one. 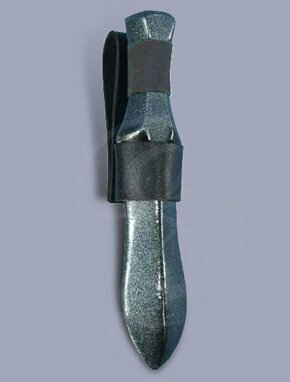 Made from two layers of hard and soft split-leather, this unique holder accepts three foam throwing knives. It features individual loops for each knife and leather strings for added security around the grip. You'll never lose your knives in this stylish holder. Unless you LOSE THEM IN THE SLIMY INNARDS OF YOUR LATEST VICTIM!!!! HAHAHAHAHAHAH! HAHAHAHAHAH! MUHAHAHAHAHAHAHAHAHAH!!! !